Estonians tend to think of themselves as “nature people”. This concept is pretty vague and describes a way of seeing the world. But nature is something foggy, holy and definitely distant: it has nothing to do with our everyday lives in urban environments. The stronghold here for “nature” is the forest. In reality most of the “forest people“ live in cities, but the forest they desire is prohibited in the city. The reason is that in the urbanisation process a large number of “nature people” have lost their skills and ability to live with the forest as it is, without domesticating and controlling it. So they are afraid. City parks are only sad quotations of forests and, in spite of the fact that they are tailored to civilization, they are not satisfying. So we need something in between, in terms of both concept and structure. A thicket, as an overgrown group of bushes, has a negative meaning amongst Estonians. It’s used to describe neglected wastelands, deserted fields and other areas removed from human use, order and control. But from the perspective of biodiversity a thicket is a very rich society of plants, insects, animals and birds. In the urban context, a thicket as greenery is even worse because an abandoned space in a dense settlement is a potential area for criminal activity. It might produce more fear or an aura of crime than crime itself. So to avoid these negative connections local governments have very strict rules for greenery maintenance. The urban thicket as a new modern movement has lots of enemies and it produces a major conflict between generations. Biologists and botanists have a non-aesthetic interest in thickets: they focus on biodiversity. So preserving the urban thicket is a goal for many special interest groups, but for different reasons. What unifies these groups is that they all have the same main goal – to change the way people perceive the urban thicket. Danish architect and urban design consultant Jan Gehl has said that he has been talking about the walkable and human-scale city for 50 years and finally people are starting to listen. Changing the way people think is a slow process. It starts with determining possible users and then finding the best target group, which turns out to be children. They use the city environment in different ways than adults; since they move more slowly they have time to take in all of the sights, to smell, touch and climb. They see water as water, not the form the water is in; they see a thicket as a place to play, not as decoration or a functionally limited part of public space. They use the environment the way they need it at that moment. And this is the sign of a good public space: one that allows the user to make choices, a space full of affordances that offers activities for a wide spectrum of citizens. Different users act as different “species” of humans, who all have their distinct views of the city, nature and nature in the city. To find a balance between those different opinions, we need to work out a usable “preserve” that has a range of characteristics. It should be practical, beautiful, economical and biologically rich. The main conflict in semi-natural or natural greeneries is the debate between what is considered ugly versus beautiful. Different people have different perceptions of nature: some may think untidy natural environments should be kept outside of the city, as the city is artificial and the countryside is natural. Some may think that flowers are beautiful, but that weeds are ugly etc. But there is a new type of citizens, weed gourmands. They value plants that would normally be regarded as weeds as they do not bloom in the traditional sense but still have form, structure, fracture and patterns. 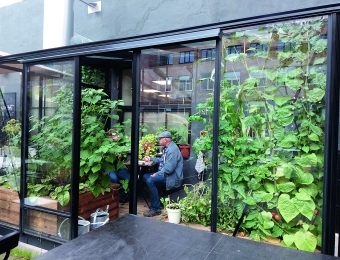 Plants that were not traditionally cultivated but still function as green space for urban areas. The group of people who value this kind of greenery is growing, they are a mirror group for this sort of new urban landscape. Aparaaditehas was designed in 2017 and built in 2017. It was formerly a widget factory in Tartu, Estonia and its regeneration process started around 2012. Now it functions as a culture factory. Before its regeneration, the factory’s courtyard was almost empty, so nature took over. When we started working on the courtyard, our main goal was to somehow keep the balance between the large number of people who would use it and the fragile society of wasteland plants that were growing in every crack and seam. The courtyard had to be usable for many people and at the same time it had to retain the look of an old factory. So we divided the space into public/semi-public and active/passive so the courtyard would be usable for all kinds of activities, involving everything from lorries to children’s games. We made a public greenhouse for the tenants to grow vegetables in, but it was also a place to drink coffee when it rained and to eat lunch. During the construction, we kept most of the self-evolved thicket. The new plants selected were mostly those we all know as weeds; maintenance was rare: we allowed almost everything that was surviving there to grow. We regulated as little as we could. 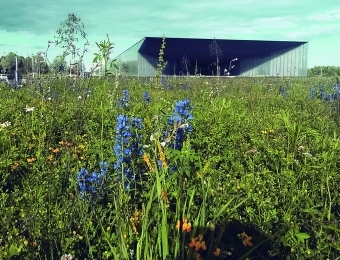 Those half-wild plant species toned down the slightly clinical feeling that came with new pavement and helped to retain the feeling of an old factory. Two depressions were made in the new asphalt so that puddles could form for children to play in after it rained and for animals and birds to drink from. Also they nicely reflected the lights hanging above the courtyard at night. This was a flashback to the old courtyard, when the broken pavement was full of holes and after it rained the stars and lights were mirrored in countless small puddles. After the departure of the Soviet Army, Raadi Manor remained empty for many years, which allowed nature to take over the whole area. A rich ecosystem thrived: with many plants, birds and animal species. 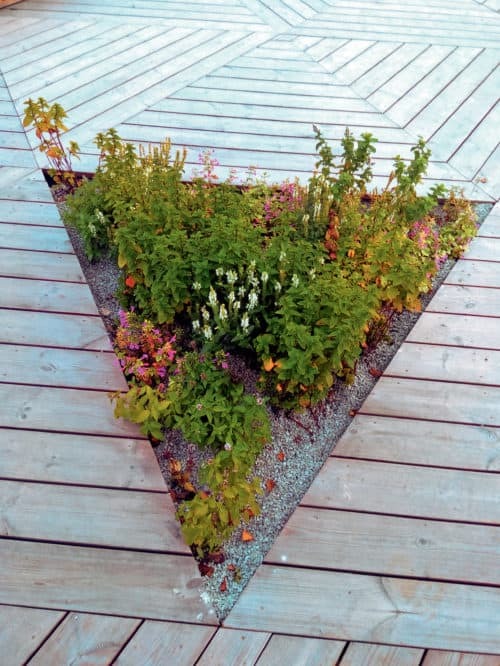 When it came to the Estonian National Museum, it was clear that we wanted to maintain this idea of ​​biodiversity. On the one hand, it was inconceivable that the museum could take care of dozens of hectares of landscape on a daily basis. 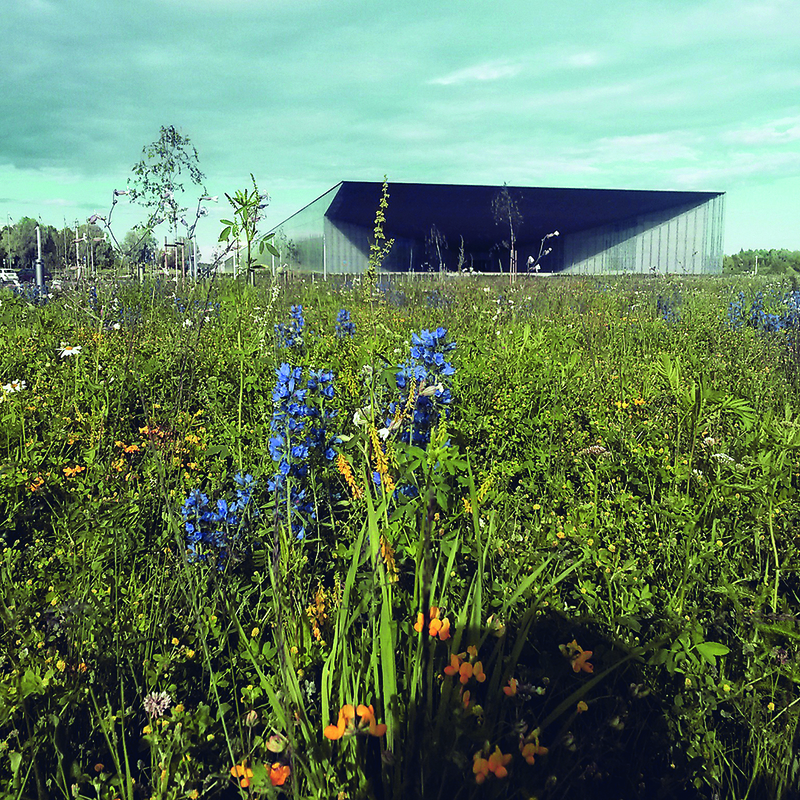 On the other hand, it was conceptually clear that the surroundings of the Estonian National Museum should reflect a natural way of life, which meant a landscape that would mainly take care of itself. Local species were used around the museum, and the landscape was preserved as much as possible . The construction involved a great deal of excavation, so all of the vegetation had to be restored. The only regular element is a orthogonal net of birch trees that filters the views of the landscape in the background. The plant community includes shrubs suitable for soil, spring bulbs and weeds. Last year, the museum’s grounds flourished throughout the summer, and the flowers varied according to their growth cycles. At the end of the summer, the hay was mowed and carried to the horse stable on Roosi street. When it became clear that the Estonian National Museum’s new building would really be constructed in Raadi (on the outskirts of Tartu), it was necessary to start thinking more precisely about the way people would come to the museum, and to think about the surrounding area. Raadi is psychologically far away for Tartu citizens, because it was a closed district during the Soviet time. So we created a plan to re-organise Roosi street. The street runs almost straight from the city centre to the museum, a distance of under two kilometers. We focused on convenience for pedestrians and cyclists. The main transport route for ​​cars and buses remained on Narva road. The idea was to mentally shorten the distance between the heart of the city and Raadi through the activation of Roosi street. If the distance appeared to shrink, this would “move” the museum closer to the city, making it more accessible to foot traffic in particular. 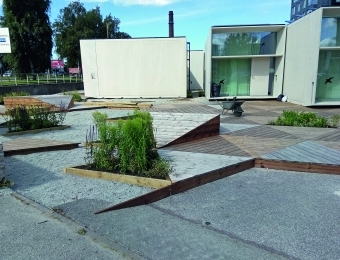 In addition to other goals, such as preserving diversity and the “chaos” characteristic of a neighbourhood street, where children played and the last public well existed, while the street became a part of an internationally important cultural object, we wanted to continue to keep the semi-natural association of plants we had used around the Estonian National Museum to keep the mood of the environment consistent. Adjacent to the street, there was already a natural area that used to be a former military zone, surrounded by a barbed wire fence. We made an alternative wooden path within that area to give people a chance to look closely at details from a disappearing era. The landscaping of the whole street was consistent with the formation of semi-natural communities that have developed over the years. We used local weeds and flowers, the maintenance rules were strict: mowing was allowed only once a year, at the end of the summer. There are plants under the third protection category (marsh helleborine). This is a unique situation: less than two kilometres from the city centre it is possible to see these species; normally you have to drive an hour to a bog to find landscapes like that. The reactions of people to such landscapes are double-edged: happy or angry; indifference is rather rare. This shows that the theme does matter and it needs to be explained and worked with. This year, in cooperation with botanists, it is planned to complete the plant gardens around the Estonian National Museum and on Roosi street. In order to get people used to more semi-natural communities, flowers (poppies and cornflowers) will be planted in the first year. These flowers are not usually found on a permanent basis; they are more likely to represent an intermediate stage. Undoubtedly, the urban thicket is one of the most prevalent methods used in urban greenery. People need to be given time to get used to it and realise its benefits. The process has started; now let’s not be discouraged by criticism. 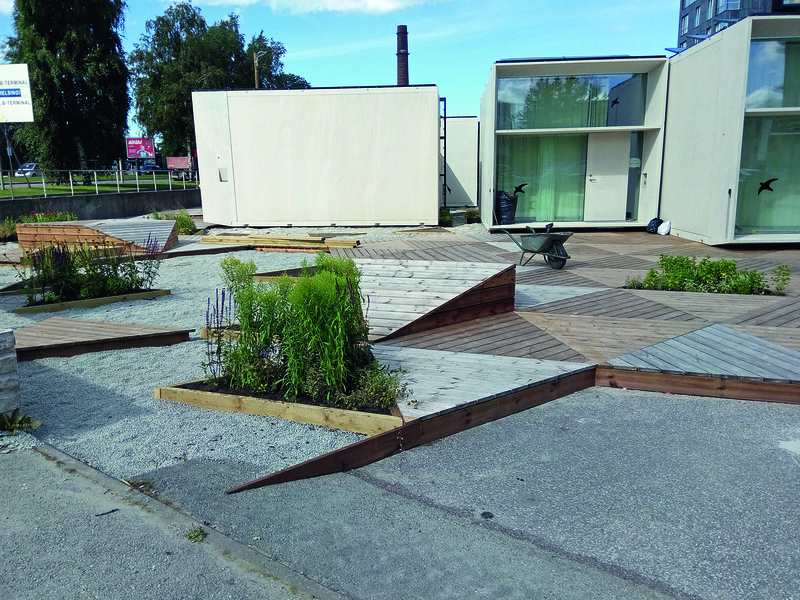 This article is a short overview of how we (the landscape architecture office Kino, which includes Mirko Traks, Uku Mark Pärtel, Kristjan Talistu, Juhan Teppart and Karin Bachmann) deal with these issues. Karin Bachmann (b.1976) is a landscape architect and partner in the Kino firm; she is a member of the creative council of Aparaaditehas, a member of the Estonian architecture union and landscape architecture union, a member of NGO Loomus, and a member of the creative panel of the architecture magazine Maja.